Last month, we took a look at the Top 12 Outer Banks Landmarks. To the surprise of our readers, we didn’t include a single lighthouse on that list… but this was completely intentional. From the tallest brick lighthouse on the continent to a replica of a lighthouse lost to the sound, each of the five magnificent lighthouses on the Outer Banks are so unique and beautiful that we felt they deserved their own list. Serving as both as an educational landmark and connection to our coast’s unparalleled maritime history, a visit to the OBX isn’t complete until you visit one or more of The 5 Lighthouses of the Outer Banks. The Currituck Beach Lighthouse is a 162-foot tall brick lighthouse in Corolla, NC. Boasting a first-order Fresnel lens that can be seen up to 18 nautical miles away, Currituck Beach Lighthouse flashes at a 20-second interval cycle with the light being on for 3 seconds and off for 17 seconds. Recognized by it’s natural-brick color, this lighthouse stands 158-feet above sea level and is the northern most lighthouse in North Carolina with the next coastal lighthouse located 34 miles north in Fort Story, Virginia. With awesome 360-degree views of the surrounding Currituck Sound and Atlantic Ocean beaches, adventurous visitors can climb the 220 steps to the top. History: The Currituck Beach Lighthouse opened on December 1, 1875. The need for a lighthouse in Corolla was noticed when, although the Bodie Island Lighthouse and the Cape Henry Lighthouse (in Virginia) had already been in operation, ships continued to be lost at sea in the dangerous shoals between the reach of the other two lights. Burning lard oil was the original light source until 1884 when mineral oil was used. It wasn’t until 1933 that an electric source was used but this required a manual rotation system to be cranked by a lightkeeper every few hours. The Currituck Beach Lighthouse was finally automated in 1939 and operation was absorbed by the US Coast Guard the following year. In 1990, the lighthouse was in need of a restoration so the non-profit group Outer Banks Conservationists Inc. (OBC) took over maintenance of the premise through a 30-year lease with the US Coast Guard in order to make repairs and open the lighthouse to the public. in 2003, the deed for the lighthouse was officially handed over to the OBC (utilizing the 2000 National Historic Lighthouse Preservation Act) who still maintains the site today exclusively through private funding. Did You Know? The Currituck Beach Lighthouse was made built with approximately one million bricks! Located on the soundside marshes of Nags Head, the Bodie Island Light Station (pronounced “body”) is a 156-foot tall functional lighthouse north of Oregon Inlet and is managed by the National Park Service as part of the Cape Hatteras National Seashore. The lighthouse has a first-order Fresnel lens with a unique rotation pattern with a visible range of up to 19 nautical miles. Both a ranger’s office and visitor center are on site along with the distinct white and black horizontal-striped brick lighthouse tower. Those who decide to climb the 214 stairs to the top will love the 360-degree views of the Pamlico Sound and the Atlantic Ocean, as well as the surrounding marshes. History: Like many of the other lighthouses on this list, the need for a lighthouse arose in the early 1800s when it was noted that the rough currents and dangerous shoals created a treacherous situation for ships along the North Carolina coast in which many were lost at sea. With Congress appropriated funds, construction for the first lighthouse began in 1847 south of Oregon Inlet. Unfortunately, the 54-foot tall structure with an unsupported brick foundation starting leaning within the first two years of its operation. Unable to be fixed despite numerous repairs, the lighthouse was abandoned in 1859 when it was replaced by a second lighthouse built nearby. The second 80-foot tall lighthouse, however, was destroyed by Confederate troops in 1861 during the Civil War. Surprisingly, a new lighthouse was not built at the end of the war and the Lighthouse Board did not have plans to rebuild one despite input from ship captains on the necessity of a visible light. In 1871, however, construction on a third lighthouse did finally begin. The new tower was built on a 15-acre site north of the Oregon Inlet. The lighthouse became operational on October 1, 1872 and was equipped with a first-order Fresnel lens. It wasn’t until 1932 that the light was electrified and in 1953, the site was taken under the control of the National Park Service. Visit: The Bodie Island Light Station will be open for climbing for the 2019 season from Friday, April 19th through Monday, October 14th. On the opening day, lighthouse climbs are free of charge but the normal admission is $10.00 for adults. Tickets are only $5.00 for seniors over 62, children under 11 and those with disabilities. Tickets can be purchased on-site and climbs run every 20 minutes beginning at 9:00 AM with the last tour departing at 4:30 PM. Be sure to review the NPS website for weight and height restrictions and other safety rules. Did You Know? After years of being too unsafe for climbers, a multi-year renovation completed in 2013 opened the lighthouse up to the public for self-guided climbs. Although the Roanoke Marshes Light isn’t a towering brick structure like the other lighthouses on the Outer Banks, its unique design that resembles a coastal lightkeepers house is exactly what makes it stand out. The lighthouse is actually stationed on a 40-yard long boardwalk that sticks out in the middle of the water off of downtown Manteo. The 37-foot tall lighthouse is actually a replica of an original lighthouse (that once stood in Wanchese) dedicated in 2004 by the town of Manteo and is managed by the NC Maritime Museum. While serving as a local historic landmark, the operational lighthouse helps boats entering and leaving the Shallowbag Bay area using a fourth-order Fresnel Lens, on loan from the US Coast Guard, that emits a fixed white light. History: The original Roanoke Mashes Lighthouse was built in 1831. Due to constant flooding and repairs, it was abandoned. In 1858, a new hexagonal-shaped lighthouse was built but since it was still exposed to flooding damage, the structure piles suffered from wood rot and this structure was also abandoned. The third lighthouse, which was the actual structure that the current lighthouse is a replica of, opened in 1877. The lighthouse sat on screw-piles on the water situated into a square cottage-like building with a short light tower on top. The lighthouse was located in the Croatan Sound off the coast of Wanchese and served as the lighthouse on Roanoke Island until it was decommissioned in 1955. The lighthouse was unfortunately purchased by a private buyer where, in an attempt to move it by barge to Edenton, it fell into the Albemarle Sound and was completely lost. After years of planning, local residents and the town of Manteo were eventually successful in the construction of a replica of the 1877 lighthouse. Moved to the Manteo waterfront area in order to coincide with the push for educating visitors on Manteo’s maritime culture, the new Roanoke Marshes Lighthouse was opened in 2004. Visit: Visitors are welcome to visit the Roanoke Marshes Lighthouse site and walk along the boardwalk any time of the year. The building, however, is only open during the “in-season” and hosts an exhibit about the lighthouse’s history. Admission is free to walk inside but the light tower is not open for climbing. The awesome sound front location and close proximity to nearby Roanoke Island Maritime Museum make it a popular destination for visitors who want to learn more about Outer Banks history. Did You Know? Visitors can check out an original screw-pile leg on display that was discovered in the sound by the US Army Corps of Engineers and is believed to have been part of the original 1877 lighthouse making the unique cylindrical artifact well over a century old. Easily recognized by it’s unique diagonal black and white stripes, the Cape Hatteras Lighthouse is known for being the tallest brick lighthouse in North America at a height of 208 feet. The automated lighthouse is powered by electricity with a rotating light beacon that flashes white every 7.5 seconds and can be seen at a range of up to 24 nautical miles away. In 1999, an incredible achievement occurred when the approximately 4,300-ton Cape Hatteras Lighthouse was moved a distance of 2,900 feet using a system of steel track beams and hydraulic jacks. The entire project took 23-days and cost around $11.8 million dollars. By 2000, the lighthouse was re-opened to the public for climbing and most recently, received a fresh coat of paint in 2014. A visitor center and two historic lightkeeper’s quarters, which were also moved, are all on site. 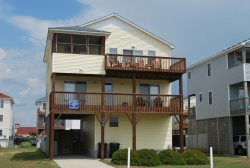 If you venture up the 257 steps to the top of the balcony, you will be rewarded with incredible 360-degree views of Hatteras Island, the Pamlico Sound and the Atlantic Ocean. History: As the shoals off the coast of Cape Hatteras were becoming infamously recognized for their extremely dangerous conditions, Congress authorized the construction of a lighthouse in 1794. Construction began in 1799 and in 1803, the very first lighthouse at Cape Hatteras was operational. The structure itself was 90-feet tall, lit by whale oil, made of sandstone and kept its natural sand color. To improve visibility, the Lighthouse Board later added 60-feet to the structure, installed a first-order Fresnel lens and painted it red on top and white on the bottom. Unfortunately, the deteriorating structure was in a constant state of needing repairs which resulted in Congress appropriating funds to construct a brand-new lighthouse. The second lighthouse was first operational on December 1, 1870 and the original sandstone structure was demolished the next year. In 1873, the new structure was painted with the diagonal black and white stripes that still exist today. A Fresnel lens was installed that needed be manually rewound each day until it was eventually electrified in 1934. It would be just one year later in 1935 that the lighthouse would be decommissioned by the Bureau of Lighthouses due to the encroaching tides caused by erosion. Since there was still need for a light, a skeletal steel tower (The Buxton Woods tower) was used as a placeholder lighthouse until 1950 and during this time, the grounds were taken over by the National Park Service and served as an observation tower during World War II. By 1950, beach stabilization allowed the beacon to be returned to the Cape Hatteras Lighthouse. Unfortunately, despite initial stabilization, erosion continued to threaten the structure. By 1980, the lighthouse, which was originally built about 1,500-feet from the shoreline, was only 50-70 feet from the shoreline. To save this historic landmark, it was decided that the entire lighthouse would be relocated in 1999. At its new location, the lighthouse once again sits at approximately 1,500-feet from the shoreline and is positioned on a steel-reinforced foundation made of concrete slab, brick and rock. Stone markers are still situated at the site of the original location allowing visitors to get a good look at how close the lighthouse was to the ocean. Visit: The Cape Hatteras Light Station will be open for climbing for the 2019 season from Friday, April 19th through Monday, October 14th. On the opening day, lighthouse climbs are free of charge but the normal admission is $8.00 for adults. Tickets are only $4.00 for seniors over 62, children under 11 and those with disabilities. Tickets can be purchased on-site and climbs run every 10 minutes beginning at 9:00 AM with the last tour departing at 4:30 PM. Be sure to review the NPS website for weight and height restrictions and other safety rules. This year, eight (8) nighttime “Full Moon Tours” will be held June 17th and July 16th at 8:30 PM and 9:30 PM, August 15th at 8:00 PM and 9:00 PM, and September 14th at 7:30 PM and 8:30 PM. Tickets can be purchased before the climb online. Did You Know? This year marks the 20th anniversary of the famous 2,900-foot lighthouse move in 1999. In commemoration, a 20-minute informational program will be hosted daily from May 3rd to October 14th at the Visitor Center Pavilion. Plans for a special anniversary event are underway. The Ocracoke Station Light is a 75-foot tall brick lighthouse that sits on the western side of the island near the Ocracoke Inlet. There are 86 steps to the top of the lighthouse which emits a stationary beam of light visible up to 14 nautical miles away and is now completely automated. In order to access the lighthouse, visitors and residents who are not already in Ocracoke Village will need to take the ferry from Hatteras Inlet to Ocracoke Island and drive into the village. Unlike the natural brick Currituck lighthouse or the two black-and-white painted Bodie & Cape Hatteras lighthouses, the Ocracoke Island Lighthouse is entirely white. The exterior color comes from a unique mixture of lime, salt, rice, glue, and boiling water giving it a textured whitewash look. History: By the 1700’s, Ocracoke Inlet was an extremely busy inlet due to being the best route to reach popular inland ports such as New Bern and Elizabeth City. With the need for navigational aid through the inlet, a lighthouse was built in 1794 on Shell Castle Island which was located near a channel between Ocracoke Island and Portsmouth Island. Over the years due to the shifting channel, the once-appreciated wooden light tower was no longer efficient and was unfortunately destroyed by lightning in 1818. A new lighthouse, and the same structure that stands today, was built on Ocracoke Island beginning in 1822 and became fully operational by 1823. Originally an oil-burning lighthouse with reflector systems, it was replaced with a fourth-order Fresnel lens in 1854. Although the lens was temporarily dismantled by Confederate troops during the Civil War, it was re-installed by 1864. By 1955, the light was automated. The lighthouse is currently maintained by the US Coast Guard and the land itself is part of the National Park Service. Visit: Visitors on Ocracoke Island can visit the Ocracoke Lighthouse site year-round. However, due to its age and potentially dangerous structural integrity, the lighthouse tower is not open for climbing. There is no museum or visitor center on site but the original lightkeeper’s house sits nearby. Did You Know? The Ocracoke Island Lighthouse is one of the oldest operating lighthouses in the United States and is the oldest lighthouse in North Carolina that is still in operation. Lighthouses are tower-like structures that produce a beacon of light to signal the approaching coastline and aid in maritime navigation. Although many lighthouses are still operational, their necessity for safe sea-travel has declined over the years since maritime navigation greatly benefited from electronic GPS systems. For many years, fuel sources like burning lard and oil dimly lit towers that were very hard to see from sea. This would all change when in 1822, French physicist Augustin Fresnel (pronounced "fray-nel"), invented a lens with multi-faceted prisms that would focus light rays into a single beam. This lens, known as the Fresnel lens, allowed light to be visible over longer distances and was installed in many lighthouses along the coast. Fresnel lenses are rated by order depending on their size and focal length with first-order lenses being largest. To streamline operation of these important life-saving structures, the United States Lighthouse Board was established in 1852 and was the primary agency responsible for lighthouses along America’s coastline until 1910. The US Lighthouse Service or Bureau of Lighthouses took over until the late 1930s when upkeep and operation of all lighthouses became the responsibility of the US Coast Guard. A very notable achievement of the Lighthouse Board was the assignment of “daymarks” and a “nightmarks” to allow sailors to distinguish one lighthouse from another. The daymark is the paint color and pattern which is visible to sailors during daylight hours. The nightmark is the unique light beam which can appear solid or flash and can remain a steady beam or rotate at a varying rate. Sailors relied on these distinctive characteristics to determine their location at sea and safely navigate waters along the coastline.